Update: as a result of this post, the project owners have changed their website's design, project name from Bitcoin White to Bitwhite, updated their promo video, and removed the team section from their site. We still believe the project is an exit scam and will continue to warn people against it until they show any technological advantages that aren't already present in countless other projects. Bitcoin White (BTW) is one of the newest crypto scams out there in the wild west of cryptocurrency. In case the website changed since this post was published, we've archived it here. A scam fork is a fork of a blockchain with the aim to use the original blockchain's brand name to win over users and potentially cause vulnerabilities like Replay Attacks. For example, the Bitcoin Gold fork is a fork of Bitcoin's blockchain which kept the Bitcoin name to get instant high-value for the tokens and many users on day 1 despite not actually offering any technical innovations or Replay Attack protection, as described in the article linked above. If the authors of this “innovative” blockchain came up with something the Bitcoin developers haven't thought of and really do have something better, it would be in their best interest to start anew with both blockchain blocks and brand and build an honorable name for themselves. Otherwise, they're just printing “free money” in the form of these digital fork dividends. If Charlie Lee had thought of Litecoin in 2018, you can be sure it would be called “Bitcoin Lite”. Let's look at the project up close. The promo video is an obvious template video from a site like Videohive. Such templates allow customers to insert presentation slides in fixed placeholder positions, making the video look custom and unique. In this case, terminology which many associate with blockchain was inserted: byzantine fault tolerance (something every blockchain has), secure sandbox, dapp store, decentralized voting (something which sounds cool but makes no sense in the context), etc. Many projects use such services because they lack specific knowledge or budgets to pull off truly unique videos, so they settle for putting “technology magic” terms into animations. Thus, on its own, the video isn't an indicator of a scam, but it does lay some good foundations for our case. 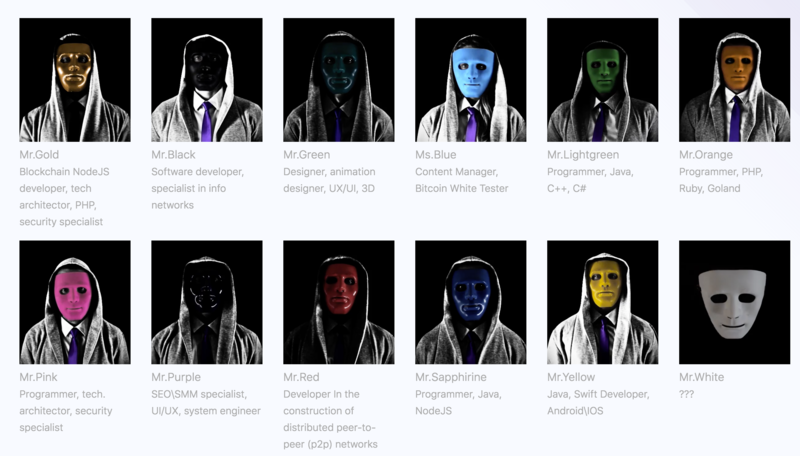 Bitcoin White's team is all anonymous “members”, which is equivalent to an owner dressing up as 10 different people and calling the photo session a team. Taking into consideration the various typos (Goland instead of Golang, architector) and the “qualifications” of these team members, we can easily conclude that it's nothing but a hasty fabrication. This section of the website is also a sea of typos and broken English. All we can conclude from this is that Bitcoin White plans to use “sidechain architecture” somehow – a technology not even real teams like Bitcoin Core devs or the Ethereum foundation have figured out yet. Other than a healthy dose of buzzwords (technobabble which sounds cool), nothing has been concretely explained and the other slides reveal nothing useful or insightful. Apparently these were written to appeal to the average, technically illiterate investor. The WP is the most important part of any project's presentation. It's a document in which the founders explain why, how, and what is being done and how the project is different from the others like it. The BTW whitepaper can be found here or if they've taken it down in the meanwhile, we archived it here. The WP itself is actually a direct (and rather bad) copy of this one and others like ACC, MOC, ZPC and similar whitepaper clones with the same unattainable ideas. It's obvious that the team “working” on Bitcoin White has no idea what they're talking about and have to resort to cannibalizing other people's work. They even follow the sections and concepts verbatim from the original. The docs are relatively poor, but also full of broken English and various punctuation mistakes. The whole text is obviously translated with Google Translate from original Chinese on the original page and then copied to Bitcoinwhite.org. The copy is so obvious they even copied the MarkDown errors so the formatting breaks and shows the raw text instead of rendering properly. Although by now the scam is rather obvious, let's check the software, too. 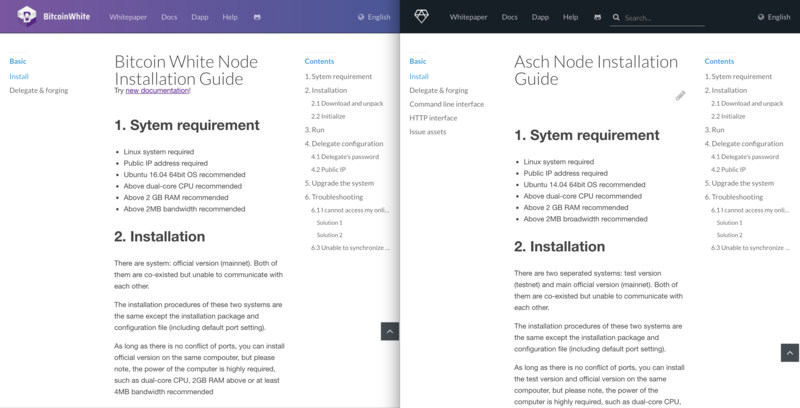 If we compare the repositories of the projects, the Asch repository is far older and more active than the repo of Bitcoin White, which has only existed for 2 months and is little more than a direct copy with altered file names. 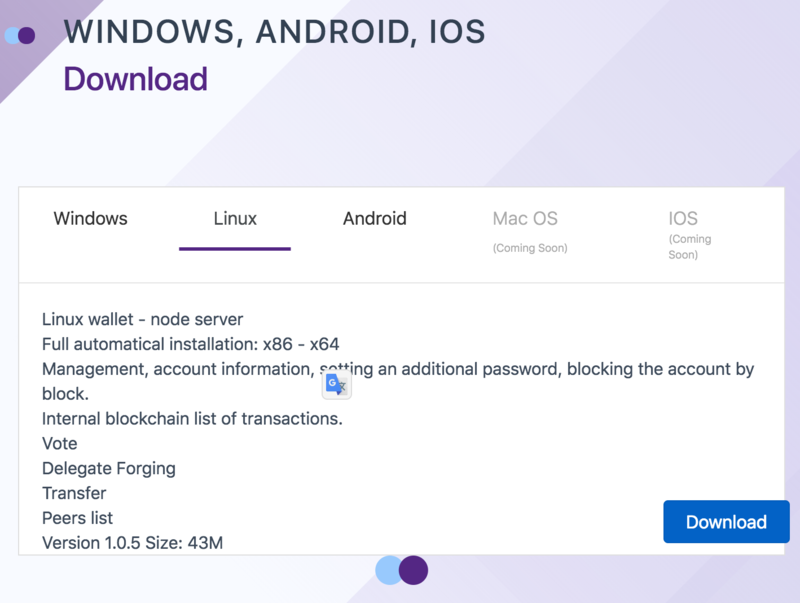 The team claims they have a wallet ready for Windows, Linux, and Android. Let's test the Linux version. The wallet downloads information from a singular IP: 46.105.68.73. It appears that this IP address is actually equivalent to http://wallet.bitcoinwhite.org, only when accessed via IP it doesn't serve content through HTTPS (SSL), but through HTTP – the less secure option. Real blockchains never download all block data from a single server – that's the very definition of a centralized system. If this process is allowed, though, the app will pull 200 by 200 blocks from the server until it reaches 500k or so. The same happens when you run the Asch project's wallet. We haven't tested further – the plagiarism is obvious. The interface does have some other features announced, like a BTC/ETH/Dash wallet, but whether or not those will ever be implemented is highly dubious. Due to an obviously plagiarized WP, stolen software, copied and badly Google Translated website, as well as beating around the bush with buzzwords and terminology meant to confuse readers, a complete lack of a team (anonymous team members are not team members at all) and a near total absence of any kind of technological innovation, in addition to the cheap reuse of the Bitcoin name for an unrelated project and questionable marketing tactics, we're fairly certain that proclaiming Bitcoin White a first degree scam is the right choice. When asked about the plagiarism in their Telegram group (which has an impressive 23k members), we were promptly banned without any counter-arguments, which further reinforces our impression. If you find an announcement about this project anywhere else, be sure that it's been paid for and divert their attention to this article before more people lose their money to this fraud. It is stupid article that has nothing to do with reality – BTV is not a fork, it’s a coin with its own blockchain, generously gifted to all comers and existing solely because of its community. The author is an idiot. The article says BTW is not a fork. It also says it has its own blockchain. You obviously didn’t read the post. 2. With the new events(Bit-z voting, rebranding) and promoting on media, team already was working on new web design that contains even promotion video what you mentioned above cover letter before the article. So there is no relation between your writing and them. Please do not tout! 3. By the beginning of your article with unfair mode you directly called BTW as scam! That’s just directing people with wrong way or your thoughts, not fair! e- Google it do search more, pls man pls!!! Please be respectful before to accuse any!.. 8- White Paper… As all skeleton of your Scam Alert is here! “Heey that’s COPY then Scam” Did you see that your fault on BTW?! You just simple look and call it as you wish, here is your blog and no matter if you lie or slandered!.. What a honest(!) guy. Anyway let’s come to topic. As you see-read other comments that all would show you BTW, ASCH, ETH, BTC, LTC and others are Open Source techs. That means you can use their material even White Papers, softwares what else as free as you wish. Due to Freedom of Open Source World… From A to Z you can use any material even without change it, that never makes any project scam. If would be all Linux distros called as scam even Unix based iOS, OSX etc. You missed the target BTW used ASCH, ASCH used LISK and LISK used another and another used bitshares all used DpoS algorithm and that list goes on… Why? Here is Open Source.. Even you can do search ASCH-LISK and LISK-ARK similarities. c- And PLEASE Google it other project which related( COPIED/PLAGIARISM(!) ) another ones!.. 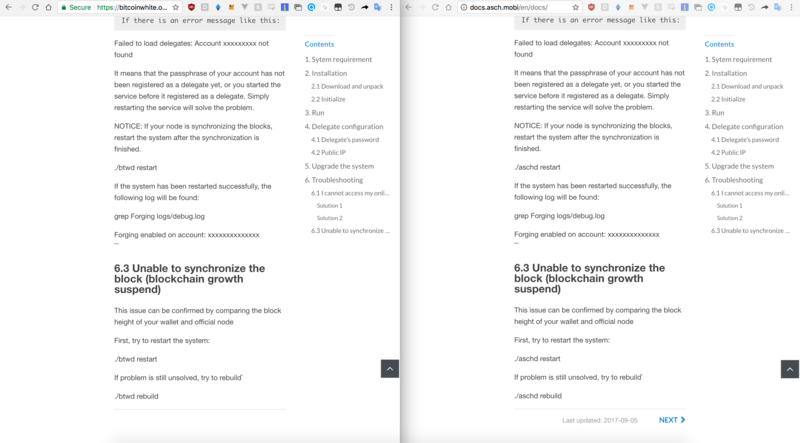 9- Docs, Software, Wallet etc… As I mentioned above Lisk and Asch have same Explorer. Lisk and ARK nearly same, so do we call them as scam in Open Source?! Of course NOOO! However your funny and weak article says scam, unfortunately! I do not wanna repeat that but for you that I’ll repeat one more time. You can use any Open Source material, tech, software even without any changing as you calimed in article’s pictures as scam(!) proof that belongs to BTW and ASCH comparing. 10- If BTW team would like to scam then they could already do it before. Team even never pumped price never manipulated it. Real scam projects teams do that but BTW never did. If they wish to scam they could do when BTW hit to 0.9$ on exchange. However team is going on its way to achieve road map, negotiating with new exchanges, addind new team members etc. And you call all that effort as scam, is that fair and justice for you?! Ah bruno ah… People on community call you as “Bruno the FUDer” now because of that dirty words of you. Please clean your fault. BTC was scam, LTC was scam, ETH was scam and many projects which similiar/familiar/same ones called as scam. Now you see them where, and after all your blackening, BTW will going on its own way and then you’ll see and be ashamed! You just manipulated, influenced, misguided people with your ignorance/misinformation or intentional fallacy on BTW at here, via your article. Then you have to release a letter of apologizing for all that misinformations. Not only BTW community but also all crypto lovers. Be respectful before accusing any! Thanks for your time for reading. Sigh. Ok. Here we go. 1. No, they rebranded after my post. If they already planned it in advance they would have told me in chat instead of banning me. Regardless, the fact that they chose “Bitcoin” in their name originally is already suspicious. 3. Because your project is a scam, yes. Once you prove you are not a scam, I will change that intro. 4. BTW does not have sidechains because it does not have any technology at all, other than what it copied. I know very well what sidechains are. Just because BTW says they have them does not mean they have any working product of any type, especially since ALL THE DATA is being pulled from ONE IP ADDRESS when you load the client (see screenshots in post). My MySQL database is more distributed than that. 5. If you read the post, but REALLY read it, you’ll see that I clearly state that a bad template video DOES NOT make a project a scam, but is a GOOD INDICATOR. And yes, it is a good indicator because generally people who actually create good things and good technology do not need scammy template videos to sell their work. Their technology is proof enough. BTW has no technology. 6. I never said every project’s team is reputable, and comparing your masked vigilante with Satoshi is an insult to the whole crypto community. I don’t understand the rest of your comment on this point, but this is an issue that is very easy to fix: either present technology that isn’t copy pasted as proof that your developers actually exist, OR reveal the team and their work history. I’ve said this many times – you can easily defeat me. Just prove me wrong. 7. Yes, good English is very important to me because it shows that the team cares about their project enough to either learn English, or hired someone to write it for them. This team not only didn’t do either, it also copy pasted google-translated Chinese from another project. This project is a scam. 8. Like I said on Twitter, just because other people got away with murder, does not mean you’re allowed to kill. You’re still a scam, even if you’re based on another scam, ESPECIALLY if you copied the source, pretended you’re original, and then accused another project of copying you (in Telegram, you told me that Asch copied BTW, which is a flat out lie). 9. Same answer as 8, only adding – no, you cannot use their website’s content, and you cannot use their docs without attribution. 11. The proof is in the posts. My problem with BTW is that BTW’s members ASKED ME to promote them. I generally ignore scams because there are too many, but when you try to ask ME to promote a scam, that’s when I go into war mode. And that is the problem I have with BTW. Why don’t mention ASCH-LISK-ARK relations even bitshares and DpoS Algorithm, used same sources? That man is really demagog and chatty. And as he or she said that yeah you have problem with BTW. No anymore talking with you. Silly and weak and “funny” arguments. Ah ha ahah! Thanks you BTW member, I see another point on that pseudo scam story now. You do realize I can see your IPs, right? I see you’re all the same person, you don’t have to keep switching accounts. article is based on illiteracy that I saw. all these thesis never rationalize what if there is scam or not. Very ignorant writing… Who wrote that long silly thing?! Ok, then defeat my arguments. I’ve read all writings even comments one by one. And result that I see article is biased for negativeness. There is no remarkable point on scam cause only inspiration and reuse is here that claimed as scam. Whereas, there is no any copy term in open source community. You can reuse, branch, vanilla any source as free. Even one of most top free license is MIT then no need to attribution to original content fo ant any material docs and white paper included to this. 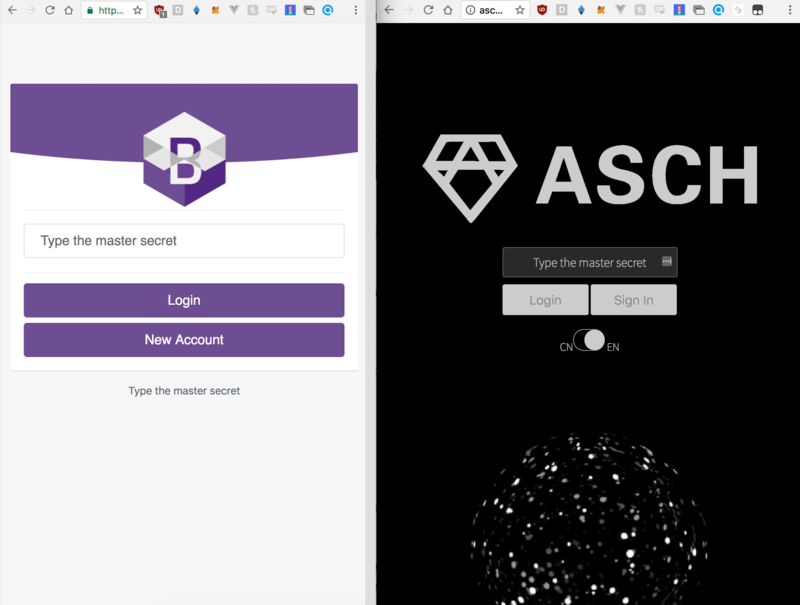 I’d not knew that Asch even, just knew LISK and Ark and after that discussion that I saw all these are mix of them as natural, all of them open source contents though. That content is not an objective nor neutral content. Smelling some like biased for hating. Right? > And result that I see article is biased for negativeness. What should a scam report be “biased” for? Positiveness? You are simply repeating things others have already said, which are not true. He’s my friend and I gave him your article’s link to read it. I got what he mentioned. You are conditioned that btw as scam. However for neutral and objectiveness you had given only arguments. But your article statrs with “btw is scam” so that is not a logic way for analyzing any kind of project. Never mind no need to dispute that article. thanks for your a house of cards on hostile scam alert. I don’t know what you’re trying to say, but probably because you’re all the same person, so it’s all the same broken English. Yes, my post starts with BTW is a scam, because the conclusion of the post is that IT IS A SCAM. If the project proves that it is NOT a scam, then the post will NO LONGER say it is a scam. See how simple it is to defeat me? Just prove me wrong, instead of pretending like you’re 1000 different people and arguing in the comments. How BTW team scam people? There is no ICO now, there is no any selling thing? If they would scam then tou could not see any website, devoloping road map any Telegram groups of it!.. In very soon, BTW will be backend valuable stuff. There is no so much coin/tokens backend with valuable material. Did you read the post? Do you have any arguments that actually refute what it’s in the post? I’m the early investor of Asch, I can tell you Asch copy Lisk a lot. You can even find Lisk logo in Asch source code in the early days. So what? Asch is still awesome project. So BTW used ASCH and then BTW is solid and great! No, you’re not. You’re forgetting I can see the IP of every commenter. Heh eheh hehe 😀 Please man do Englih teaching before analyzing! All projects looks each other now that dosen’t mean there is scam! BTW’s ICO had been done several weeks ago and team is already there. Project growing up with new features. Wait news of BTW it will backend with goldish material soon. Do you know another coin that backened with that type of worthy material? I think that you will have to excuse from BTW community soon. BTW is based on DpoS so team is only a tool, community&delegates are governing BTW. I’ll change the content as soon as it’s proven that it’s not a scam, sure. And were you able to prove that its a scam? Why would your write FUD’ualent statements when you are have not proven that it is not a scam? I been following this project for months and you have just heard it yesterday. Do some more research not just basing because you see the Devs are in mask and because you got banned from the Telegram. This project has just started and a lot of pieces are moving. Watch out BTW in the coming days. And Bruno, you are an virtual b!tch who talks yourself without strong basis. Again, if all you can do to defend the project is insult me, then you’re just proving my point. Yes, I have proven they are a scam. This post is proof. Prove me wrong and I’ll admit I was wrong. FUD for the sake of market manipulation is one thing, and I’m not interested in that. FUD for the sake of making people aware of a scam is something I am trying to do, yes. Dear Bruno, very nice article. Can you provide proof that anyone contacted Bitfalls for support. For example Universa also pays for articles. Are thay also scam? Now we have times that if you dont pay noone will promotye you, unless you have well known brand, then you can have article without paying because it will promo website. I think open source code can be used by anyone? Sorry for my english it’s not my national lenguage. I can provide proof, yes. The person who contacted me is a reader of this site so I’ll give them some time to come forward if they wish, if that’s fine. No problem, time will tell, but as master of computer sicience you should know that in IT using someone else scripts, codes is normal. I hope that this projest devs proof that you are wrong in your judgement. And after you will put this project in different light. Of course it’s normal to reuse open source code. But it’s not normal do copy it directly with almost no changes, use another popular project’s name just to get users, and it’s definitely not normal to steal the whole website, design, and whitepaper, and then pretend it’s original. Spelling mistakes and poor grammar are one thing, copying the exact same WP content from someone else who originally made it with Google Translate from a Chinese original paper is something else entirely. I gave the owners a chance to explain their copying of Asch’s WP, code, website, and ideas, but they banned me from chat, thus further proving my point. If insults are the only way you can defend the project, then you’re just proving my point. You just commented that you can create a token in 30 minutes, I’m highly doubtful about that. It seems that this is a false claim so you are now in fact a liar, I can now discredit you as liar who claims he can create a token in 30 minutes. Literally everything they did, including the website, any “technology” they “developed” and all the whitepaper content they “wrote” can be done in 30 minutes. Yes, I can make a token in 30 minutes, and so can everyone else. Dear Bruno, why do you call this scam project? They gave 30 million tokens to thousands of people and made a small ICO with 10 cents starting price. Do you think the team will sell all its coins and run away with the money? I can create a token in 30 minutes and give you hundreds of millions of it. Yes, I think the team wants to pump the value as much as they can, sell the tokens, and disappear. Please bruno, apologize for BTW Community and the Team. Because of your misunderstood and misinformation BTW has begun Rebranding to reed “Bitcoin” part! BTW just has idea to race with BTC then used Bitcoin on its name. But now rebranding is going on because of some ignorants just like you!!! Cheers!!! Please clean your calumny with apology letter. IT’s a unique COIN with several features!!! Sure, as soon as they prove they’re not a scam. Until then, I’ll keep warning people. Go ahead Mr. Bruno start to stablished your own coin now. Make it within 30minutes as you say. Another thing you can start your own code now for the website your coin. Pretending to be so smart but proves nothing about the project. Such BIG IDIOT!!! I have started a few coins already. But I would never scam people out of their money for it. Where are those few coins Mr.Bruno?any links?websites? Whitepaper? Post your link here and let us judge your coin.. Let me see please. Mr. Bruno, If I may agree with what you wrote about BTW, but failed to mentioned that 50% of the coin was airdropped. Which means majority of the current holders got it for free, and that is the large portion of BTW in circulation now. Thanks for the information, but I must ask – why do you think this is important? What a poor practice of journalism in my opinion, oh gosh I wrote down my opinion, am I journalist too now? What do you think Bruno, am I a journalist now in your opinion? Because you use a lot of opinion and present your personal thoughts as facts. Where are the facts? I read a lot “I Think” in your article and your comments. Another thing I worried about are your lack of investigation skills, you enter somebody house and making accusations and statements, and then get surprised you got kicked out. If you come to my house like that you will get kicked out too. If you are a professional and invite me too have a conversation about your story then your my guest and we can have a chat like adults. Your comments and statements also show me you have not even a simple clue about crypto and bitcoin. Fact is bitcoin and blockchain codes are open source. Satoshi Nakamoto, the most anonymous and brilliant person on earth, gave his whitepaper to the world for it to implement and improve it. It’s the revolution of IOT where we share with the crowd, it goes against the institutions where they want to protect and control everything. You referring to ADA not boosting price, well i haven’t seen any dev’s of BTW talking about prices or speculation. They working hard on their tech. If you can use ADA to make an example, i can use TRX as an example. What you think about TRX original whitepaper, they copied it also, but is TRX a scam? No! Are they working hard on their tech? Yes. Time will learn about TRX, ADA or BTW. But to call something a scam because of some poor arguments is a little shortsighted don’t you think? What else you been talking about? Website layout? You ever heard of Templates? I think that you are just trying to make a lot of drama to gain traffic to your website so people click your adds and your referral links, which are all over your website. The only one who is trying to make money out of fake practices is you Bruno. Let me give you an advise, find another hobby because you complete missing the point buddy. Yes, TRX is also a scam. No, that’s not how open source works. No doubt banks are the worst. But I can’t fight banks, so I’m fighting scams before they become as big as banks. i didn’t see any similar in this town sites https://www.asch.io/ vs https://bitwhite.org/ r u blind ?? wallet design so different !!!! Please look at the post again, visit archived links, and then compare. Dear friends, we are happy to congratulate you all! BTW is the first and only crypto community in the world, that is backed by the treasury of the United States of America. Also for the first time in the history of the blockchain industry the deal with the help of a crypto currency was made for acquisition of government securities. The transaction was successfully closed, and actually the work is being done to create and test the platform, where each holder of BTW will have an opportunity to invest his funds in the USA security papers and other security papers. The deal is valued to $ 16,984,600 or the equivalent of BTW 3,260,000 (at the rate of $ 5.21 / BTW). The payer of the International Note is the Treasury of the United States of America itself or the subject authorized by the US Treasury. Significantly, the Bill of Exchange is equivalent to the US dollar banknotes: it is a legal tender, and can be used as a reserve currency for issuing banknotes of other countries. It differs in this case only in that the issuer will not act directly as the Bank of the Federal Reserve System. IBOE is a legal tender of the US Treasury, issued directly by the US Treasury, the security of such an International Bond is guaranteed by the US Government’s Gold Reserve according to the US Constitution. According to the constitutional law of the United States, in the sphere of control by the US Treasury, payment is made upon presentation of the IBOE on the first demand, without any protest from the payer. The US Treasury Department, like the Federal Reserve Bank, has many functions to serve the interests of the US Government, as well as other institutional and private clients. In both cases, these institutional and / or private clients can open an account upon request, reserving the right to issue securities / checks on the basis of the security of the respective accounts. occurs with the Federal Reserve when issuing securities or checks. In both cases, the specified payment obligations such as IBOE do not have restrictions on commercial use, nor conditions, as it would be with other bank securities. Released IBOE is an ideal tool for monetization of any project with maximal flexibility for assignment of property rights through digital currencies. I saw this, it is a lie. Is there anyway to check it? We will keep you informed about our progress in this matter. Yes. Btw, I’m going to Mars very soon so I won’t be able to reply for a while. Do you trust me just because I said it? I am a BTW holder of only about 1k coins, but I felt the need to write something. It almost feels as if you have a bone to pick with BTW. One thing I notice immediately upon reading your post COMPLETELY was that you constantly refer to archived content and accuse the team of running scam when they change things. Please explain how this comes off “scammish” that’s like complaining that a student copied off someone’s answers during a quiz, then complain again when they ace the quiz on their own. It just seems like the team can not do right in your eyes not matter what they do. Please keep in mind that I am not accusing you of purposely delivering false information. Instead, I am asking you to possible make another attempt to reach out to the them, because as you put it “if all you can do to” attack “the project is insult “them”, then you’re just proving “the BTW community’s” point. This isn’t an attack on you directly, this is an expression of concern, because it feels as if this article can directly influence the price of BTW while it is still in its starting phase. Thank you for taking the time to read the post and comment! I do have a bone to pick with them, but that’s the same bone I pick with all scammers. I want them imprisoned so that our ecosystem is purged of projects that harm the cryptocurrency landscapce as a whole. I refer to archived content as evidence. The original software is licensed under MIT, yet BTW took it verbatim and changed the license to GNU, something which is not allowed, or in the spirit of open source. Furthermore, they took other people’s written content – something NOT open source or licensed as such – and copied it directly, passing it off as their own for months. This, too, is not in the spirit of open source, innovation, or fairness. If the team had learned from someone else’s work and done anything original, then I’d be willing to look at them again. But my attempts to reach out to the team have resulted in a ban and in insults and ad hominem attacks respectively. They are not interested in a discussion. Their fraudulent claim of being backed by GFG and US Treasury only further prove my point. I do not feel like I am insulting the project baselessly. I have delivered proof of their scam. It is up to them to prove otherwise, and something like that is very easy to do. But do you know what they claimed in chat before they banned me? That ASCH copied *them*. These are not the words of people who play fair. Auuuch! You told that MIT can not be changed?! Do I see right, you wrote down it?! Man go and find another job yourself. Or just do English teaching analyzing is beyond of your skills. MIT = FREEDOM for what ever! I’ve read the article and all comments. Indeed that article is based on ignorance, sorry Bruno. I think that you really do not know that open source philosophy. Even any project can be reused, remixed as same as source with as White Paper, Web Site structure or what else you mentioned above. All that statements never make that any project as scam. Your main point is weak as other commentors said. You looked at the exterior side of BTW then called it as scam but on the other side “interior” facts tell us project is very hard solid with its Dev Team and the Community. Scam, fraud are guilt and sin as much as lying slander. After that issue you may excuse all BTW team. 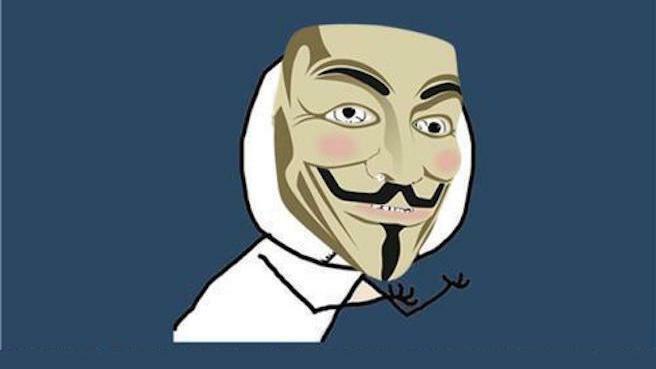 It is you who obviously does not understand how open source works. As far as your “interior” facts are concerned, the only interior fact I got was that I was banned when I started asking questions. None of this makes the project seem legit. No matter changing it to GNU cause the best option on the free licensing in Open Source world is MIT license (That’s my view). Why? Until that discussion that I thought you knew basic things and resarcher on them. However I’d seen that you’re really unlearned guy. Sorry Bruno!.. Yes, now read it all the way to the end. So you haven’t converted any copyrightable elements from the MIT license to the GPL license. You’ve simply added new ones which are only offered under the GPL license and released the elements in a mixed/combined work. Did you actually read the answer you linked to, Mr. White? Your project is clearly in violation of the MIT licence of the original software. But even if it wasn’t, your developers claimed that Asch copied BTW, which is a very blatant lie. So your all blatant FUD on that developers did not mentioned about BTW which is an Asch derivative? Really all that FUD article because of this missing detail? Your ideas worse than any scam. Yeah scam is awful thing but also your FUD! No difference between them!!! No, because of several things: copy of Asch, claim that Asch copied BTW, ban from chat, copy of docs/site without permission, lies about technology (side chains), lies about US Treasury, lies about GFG Dubai (https://steemit.com/cryptocurrency/@swader/scam-alert-bitcoin-white-bitwhite), etc. im never see u on 2009 ~ 2014 where are u in this time???? and what u think when bitcoin get scam by offer is made at 100btc / 10USD at paypal?? long ago 2009 ~ 2010, I saw the first community group trying to defend BTC holders from extreme groups that propose various reasons and insights to prove their assumptions about bitcoin are frauds, with their views and research is more better from your arguments. I am not a BTW holder but I see them trying to move in their own way in dealing with their weaknesses to become a group that makes history itself. tell to me what the last block height in folk??? I’m sorry, I don’t understand what you’re trying to say. From 2009 to 2014 I was not active in the crypto community. No need to counter arguments cause Bruno’s arguments are only trash! You’re just telling “Okay”? Is that enough to recover for blackening a huge project and community?! What else would you like me to say? Prove you’re not a scam instead of fighting in the comments and you’ve solved the problem, I’ll disappear in shame. Yes, see their home page. It’s linked there.